BLOWOUT SALE!!! REDUCED! 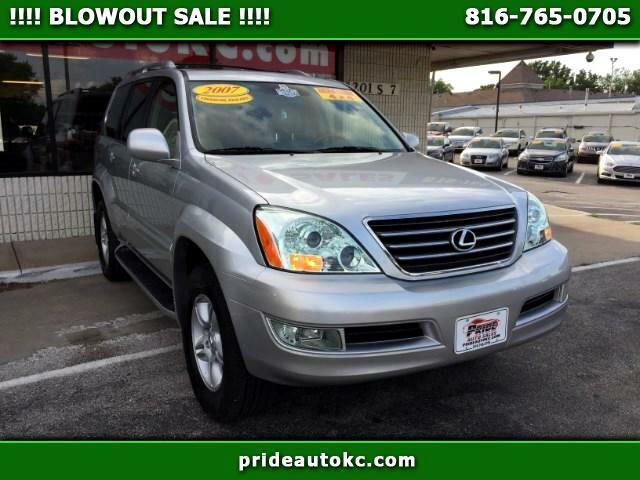 (((TIMING BELT AND WATER PUMP REPLACED))) ***1-OWNER CLEAN CARFAX*** 2007 LEXUS GX470 4WD WITH LOW MILES ONLY 123K .!!!! THIS IS AN INCREDIBLE VALUE !!!!! GOOD SET OF GOODYEAR TIRES !!!! DVD PLAYER !!!! VERY CLEAN INSIDE OUT. SILVER EXTERIOR WITH NICE LEATHER INTERIOR. !!!! PRICED TO SELL !!!! RUNS AND DRIVES VERY NICE. THIS VEHICLE HAS EVERY OPTION THAT WAS AVAILABLE INCLUDING !!!! NAVIGATION, BACK UP CAMERA, 3RD ROW SEATING, HEATED SEATS AND MUCH MORE !!!!! DON'T MISS OUT , IT WON'T LAST !!!!! 12 MONTHS/25000 MILES POWER TRAIN WARRANTY AVAILABLE !!!! STOP BY TODAY AND TAKE IT FOR TEST DRIVE YOU WILL LIKE THE WAY IT DRIVES AND HANDLES OR CALL US (816) 765-0705 . FINANCING AVAILABLE ..W...A...C...Call or text us at 816-765-0705 today to schedule your test drive. All pricing does not include a 199.00 admin fee. 12 month 25000 mile warranty is only good on vehicles with less than 150,000 miles on them. (see dealer for detail ) Call us at 816-765-0705 today to schedule your test drive.